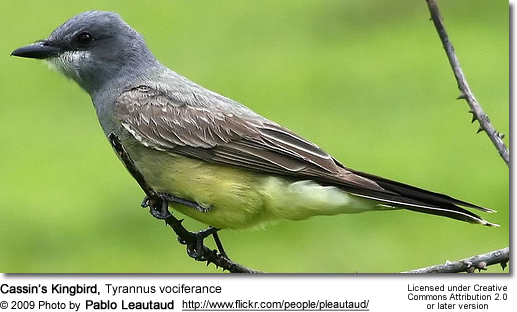 The Cassin's Kingbird, Tyrannus vociferans, is a large Tyrant flycatcher. 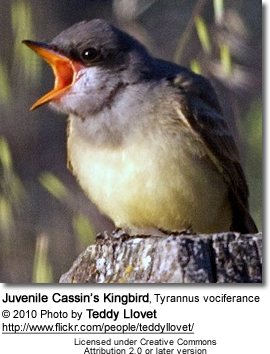 Its name commemorates the American ornithologist John Cassin. 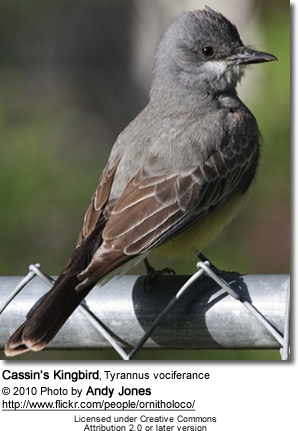 Adults have a gray head with slightly darker cheeks; a dark unforked tail with a buffy fringe and gray-olive underparts. 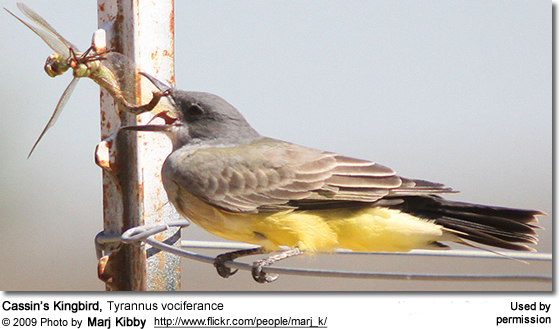 They have a pale throat and deep yellow lower breast. Juveniles are duller and have pale edges on their wings. 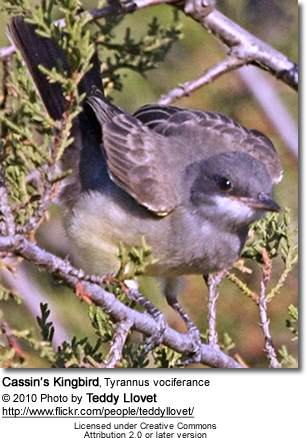 In the summer these birds can be found in California and from Montana to Utah, along the eastern Rocky Mountains. Their habitat includes rangelands and savannas. These birds migrate to their winter quarters between Southern California and northern Central America. They are permanent residents in south-central Mexico, and their main wintering ranges are west of the Sea of Cortez on Baja California Sur, and east of the sea on the mainland of western Mexico. They build a bulky nest on a horizontal tree limb in mid-story or the canopy of trees. The three to five spotted white eggs have an incubation period of 18 to 19 days. In early spring, presumably after having chosen (or shown up with) their mate, they launch into a peculiar dance. With excited high-pitched calls, they hover in unison, wings outstretched, over a favorite perch. This dance takes place several times a day over several days, over several separate sites in an area covering two or 3 acres (12,000 m2). The sites chosen for the dance appear to be the same sites used as hunting perches during the spring and summer. 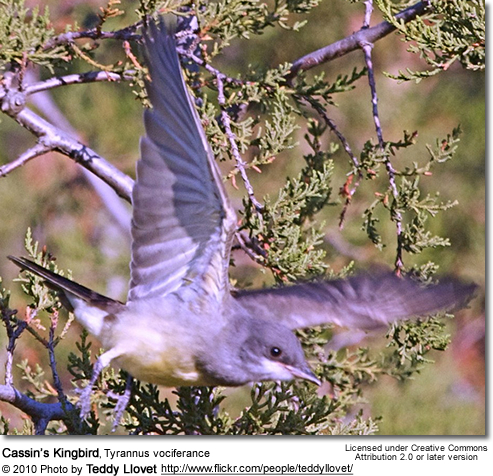 The Cassin's Kingbird primarily feeds on insects it preys upon from high perches by hawking. It also eats berries and fruits in lesser quantities. The call is a high-pitched shorter followed by a longer chirp, sounding like a 'chi-beer'.